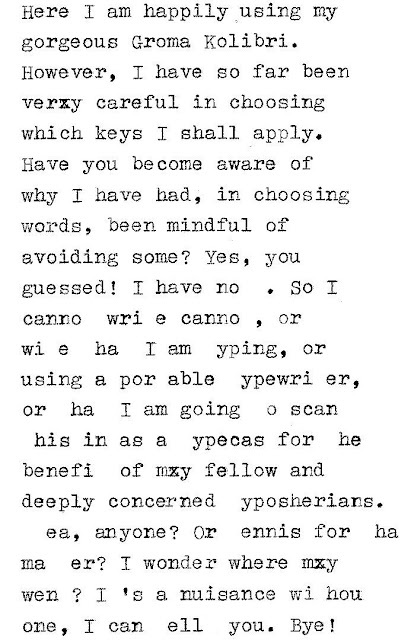 I seldom have cause to regret being the catalyst for somebody acquiring a typewriter. Take for example Tino, of Melbourne, who initially, back in the middle of May, wasn’t sure whether to thank me or blame me for him buying a Groma Kolibri. 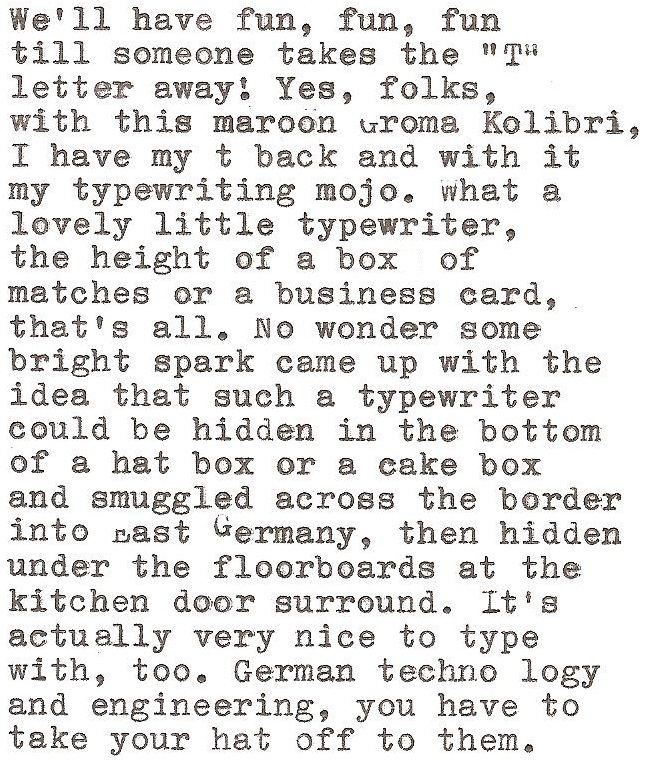 I am not going to go into any detail here about the Kolibri, or the leading role this typewriter plays in that brilliant 2006 German language movie The Lives of Others. Look how well the manufacturers packed everything in so tightly. And what a dinky little mainspring, right under the carriage! 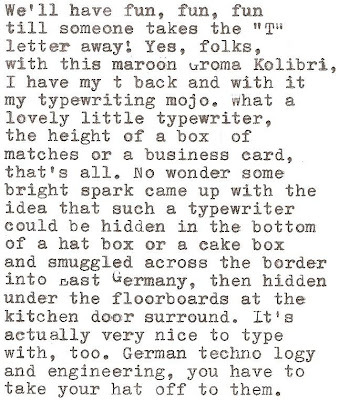 Instead, I will direct you to Georg Sommeregger’s posts, where he does a magnificent job of covering both machine and movie (including stills of the vital typewriter scenes) - as well as including a YouTube video of the Kolibri in use (and I suspect Georg might well be owner of the deft touch-typing hands). 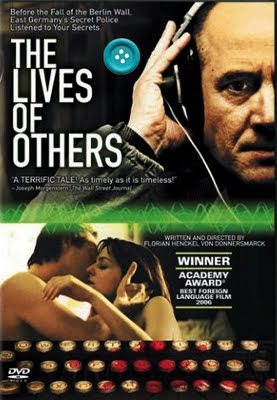 For those who don’t know, The Lives of Others involves the monitoring of the cultural scene of East Berlin by agents of the Stasi, the GDR's secret police. It won the Academy Award for Best Foreign Language Film. As all typewriters owned in East Germany were registered, a playwright uses a Kolibri smuggled in from West Germany, which he hides under the floorboards of a doorway between two rooms of his apartment. NOT a Kolibri on the cover! By the way, in case you're wondering if such a thing exists, I do own an all-red typewriter ribbon! Until now,I had no idea they had cooling vents on the back! Suffice to say, it just jumped to the top I my wish list... again. I have seen a bronze/green-looking one which took my fancy earlier in the year - but it was going for silly money. I almost consoled myself with the larger N (?) machine, but failed at the time due to lack of money. The only chance I've ever had to use one of these is when a guest of the 2nd Phoenix Type-In came with a Cyrillic Kolibri. Until then I had only heard about them, but never used. I was so jealous. The colors and paint that Groma used for these is spectacular. So clear and shiny! If I could just find one of my own! I love the look of the Groma Kolibri and would love to someday (soon XD) own one. Too bad they are so out of my price range, and rare at that. I will just have to tide myself over by looking at all those pretty pictures you posted! 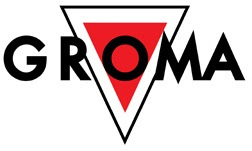 I like my Optima Elite, and I consider the GDR a good typewriter-amufactruing country. The logical conclusion would be to get a Kolibri, but there wasn't the opportunity to do so up to now. Hooray for Kolibris -- one of my all-time favorite typewriter models. 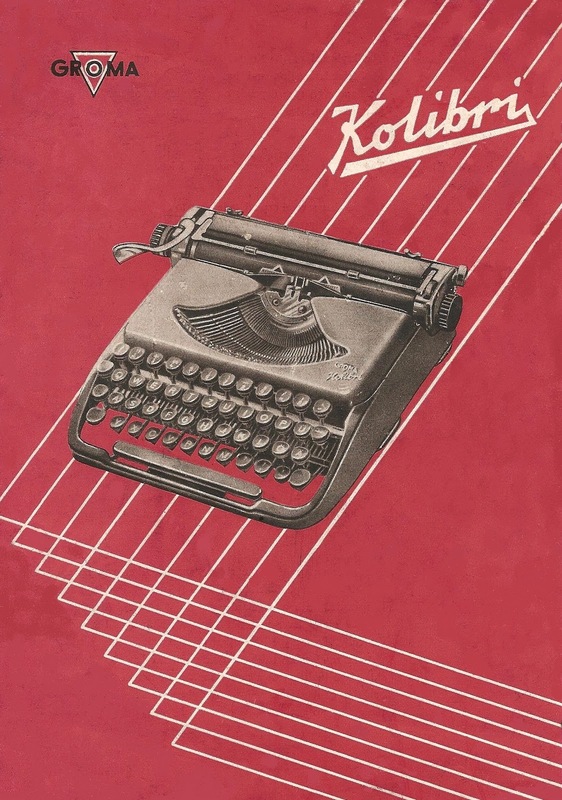 i have a groma kolibri type writer and i want to sell it can any one give me a nice price for it. 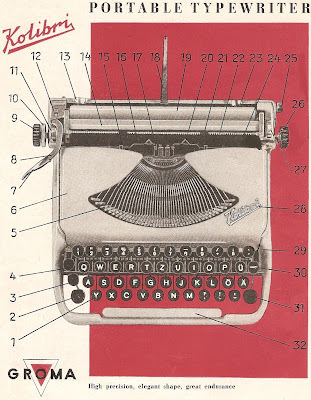 The typewriter is impressively low profile, but it is no lightweight. It weighs about of 8-1/2 lbs. That weight is in steel, plastic, and rubber, with a tiny bit of fabric ribbon. All that steel means it is sturdy, and will take a lot of pounding. But it *is* German, and it *does* have a few delicate pieces. The paper bail is a prime example; the page holder-upper is another. Treat it with care and respect. The key action is really quite good. I can type on it without feeling like my fingers are cramping up. There is no key pressure adjustment. (The Kolibri Luxus model *does* have the light-med-hard adjustment dial on the left side of the keyboard). The carriage and roller platen is not wide enough for a No, 10 envelope. It is about 1/4" too narrow. It *will* fit a No. 9 envelope. Barely. The typewriter ribbon is a twin spool mechanism. 1/2" wide ribbon, 10-12 yards long. I think there is a spool designation of DIN2103, but don't quote me. The ribbon take-up mechanism is not auto-reversing. When the type starts fading because the ribbon is stuck at the end, you can change directions by toggling the tooth sticking out from under the right hand side, below the carriage knob. There is no Tab key. This can be a show-stopper for many, and for those who need to use a typewriter for business. The typeface is not 10 chars per inch Pica, nor is it 12 cpi Elite. Its 80 chars per 7 inches (18 cm), or 11.4 characters per inch. So the type will not easily fill out pre-printed forms. But it does allow you to type 85 characters on a line with little room left over for left and right margins. The carriage can accommodate three sheets, or two sheets and one carbon. I wouldn't want to try any more than that. The bell that dings when you are around 8 characters away from the margin limit, is pretty small and quiet. Easy to miss or ignore it. Hi, I have one of these in my loft but it has russian letters. Can you tell me anything about it? I bought it at a yard sale in Norfolk VA in about 1980. I just though it was interesting. Its like the maroon one but russian. 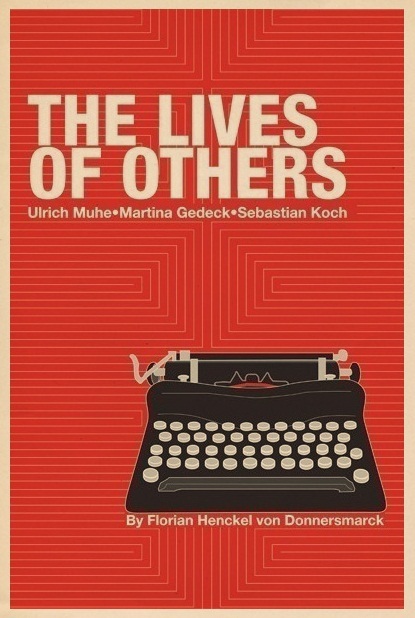 As a new owner of a beautiful Kolibri Luxus, I just watched "Lives of Others" after reading this post. It was a superb film! Thanks for the tip! 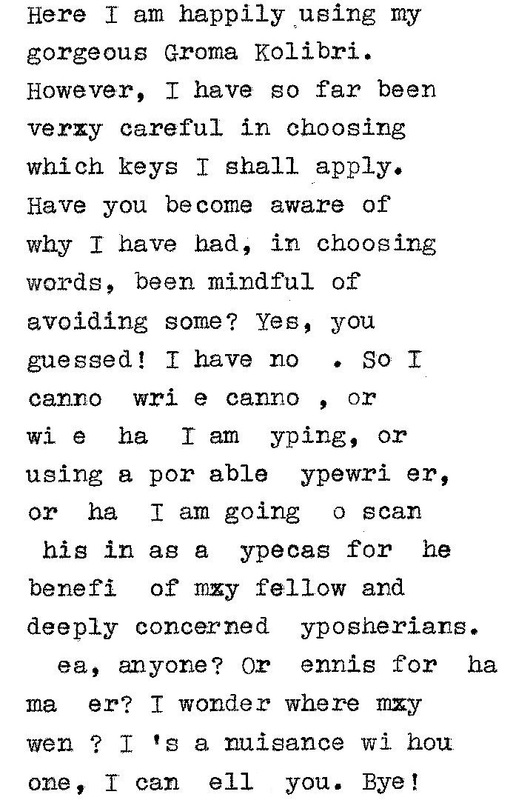 I have just acquired a beautiful 1956 Groma Kolibri, and after a bit of tweaking, she types fine and looks gorgeous. I love that the Y and Z are switched. Can anyone tell me the significance of the logo on on the rear of the machine? Looks like the number 1 rising from circles, with the number "00184" under. Thank you!